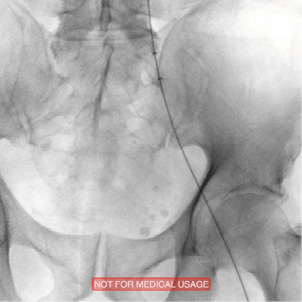 This case study illustrates the endovascular management of venous thrombosis extending from the popliteal vein to the external iliac vein utilizing a two-part ambulatory venous pharmacomechanical thrombectomy technique with the newest AngioJet™ catheter on the market, the 8-F ZelanteDVT™ catheter (Boston Scientific Corporation). Two-part ambulatory venous thrombectomy is a technique that I developed 7 years ago that involves bringing the patient into the procedure room to obtain access through a distal vein—typically the popliteal for lower extremity deep vein thrombosis (DVT). I deliver the lytic agent (usually 10 mg tPA mixed in 50 mL for a single limb) using the AngioJet Thrombectomy System in Power Pulse™ mode. Afterward, the patient is taken to the holding area, and a lytic catheter is placed (at 1 mg of lytic infusion per hour) for a minimum of 1.5 hours, possibly more depending on the day’s workflow, to allow the Power-Pulsed tPA to work. After allowing the tPA to exert its effect on the thrombus, the patient is brought back to the procedure room, where mechanical thrombectomy is performed on the residual clot. From my experience, it is important to use Power Pulse to deliver the tPA prior to performing any thrombectomy, because I believe the delivered tPA has the best chance of penetrating and distributing into the clot when the AngioJet catheter is within the thrombus without any blood flowing around the catheter. This prevents the blood flowing around the catheter from taking the tPA systemically before it has a chance to penetrate the clot. 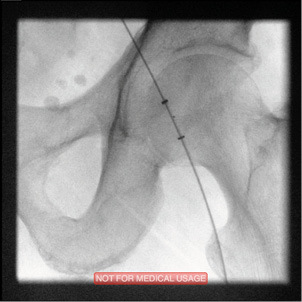 After mechanical thrombectomy and reimaging, secondary interventions such as ballooning and stenting are performed to correct any underlying lesions within the venous system. After this is performed, the patient is taken back to the recovery area to recover for 2 hours while receiving aggressive hydration. Patients receive postoperative education on potential signs and symptoms of internal bleeding, hemoglobinuria, and the importance of hydration. The patient is then discharged to home and receives follow-up calls the next morning and afternoon. I primarily choose to use this technique for three reasons. First, it has proven to be effective for me, with 90% to 100% thrombus clearance of the acute clot within the vessel lumen. This does not include intermediate or chronic age thrombus, which is addressed with secondary intervention. Second, it has proven to be safe in my experience. Although every patient will develop hemoglobinuria for 24 to 48 hours after the procedure, no patient has needed periprocedure hospitalization or transfusion for bleeding. Third, it allows for the procedure to be performed within a 6-hour period, including the 2-hour postprocedure recovery, meaning the procedure can be performed in an ambulatory fashion both in the hospital or office-based lab. A 73-year-old man presented with a 1-week history of right leg swelling. He was initially admitted to the hospital for pain and swelling of his right lower extremity. He was started on anticoagulation and discharged after 3 days in the hospital. One day after his discharge from the hospital, he followed up with his primary care doctor, who continued him on anticoagulation and called for a consultation. After the initial phone call, the patient was scheduled to see me in the office 2 days later. 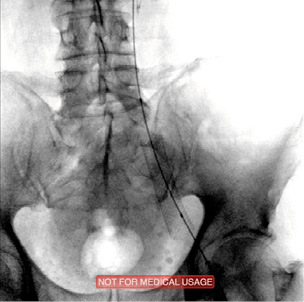 During the office visit, he brought an outside ultrasound that showed that the DVT had extended into the external iliac vein on the right side. I performed an additional ultrasound approximately 1 week after his previous ultrasound, which showed that he still had occlusive thrombus in his external iliac and common femoral veins. The patient’s past medical history included hypertension and high cholesterol. He did have an inciting factor of a prolonged car ride approximately 4 to 5 hours the week prior to his admission. The patient was scheduled on an elective basis for two-part ambulatory venous thrombectomy in our office-based lab. The preoperative reassessment in our office-based lab confirmed that the patient was still having significant symptoms. He was brought into the procedure room, placed in the prone position, and given sedation and local anesthesia. Aggressive hydration was started, and ondansetron was given. 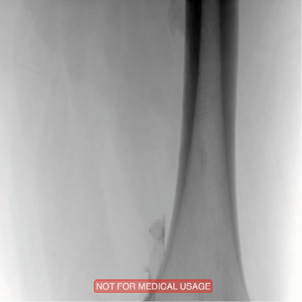 The patient’s right popliteal vein was cannulated under ultrasound guidance with a micropuncture needle. 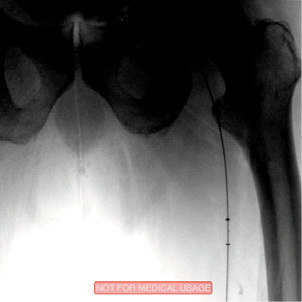 Using the Seldinger technique, an 8-F sheath was placed into the right popliteal vein. 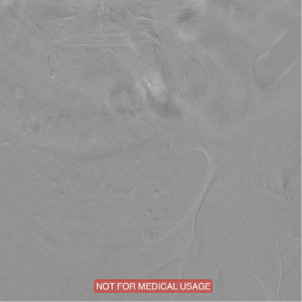 Initial venography showed that he had extensive thrombus from his popliteal vein (Figure 1) extending into his external iliac vein (Figure 2). The 8-F ZelanteDVT catheter was then used to Power Pulse the entire 10 mg of tPA along the course of the thrombus (Figure 3 and Figure 4). 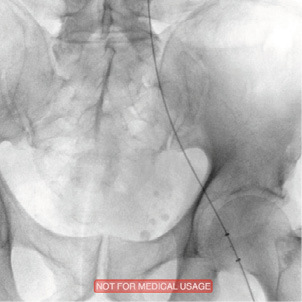 This was performed by passing the ZelanteDVT catheter to the central-most portion of the thrombus in the common iliac vein and starting Power Pulse from central vein to distal vein. After this was performed, a lytic catheter was secured in place, and the patient was taken to the holding area for lytic infusion of 1 mg per hour. After approximately 2 hours, the patient was taken back into the procedure room, placed in the prone position, and an Amplatz wire was placed up into the inferior vena cava through his preexisting lytic catheter. Mechanical thrombectomy was performed through the length of the thrombus, starting central to distal for approximately 90 seconds. 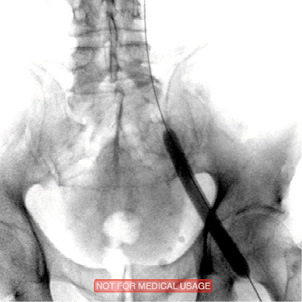 The ZelanteDVT catheter’s additional power and ability to control the direction of the thrombectomy within the vessel facilitated the ease of removing this extensive thrombus (Figure 5, Figure 6 and Figure 7). 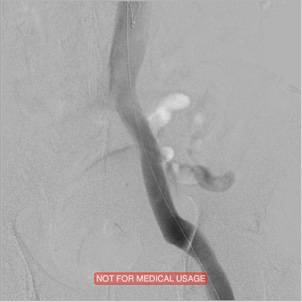 After mechanical thrombectomy with AngioJet, repeat angiography revealed that there was what looked to be a narrowing (vs compression) of the right external iliac vein (Figure 8). 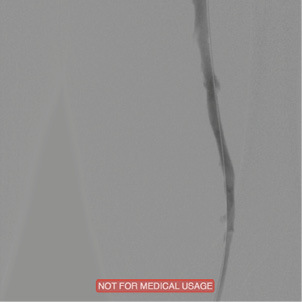 Angioplasty was then performed on the lesion with a 12-mm angioplasty balloon (Figure 9). The angioplasty did not significantly change the appearance of the lesion, so we decided to place a stent. This was then postdilated with an angioplasty balloon. 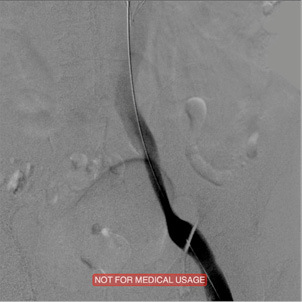 After placement and angioplasty, the stent looked well positioned and expanded (Figure 10). 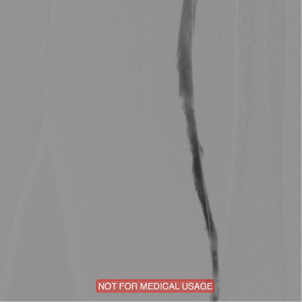 After the stent placement, repeat venography showed resolution in the narrowed area of the right external iliac vein (Figure 11). Once the iliac and common femoral veins on the right leg were free of thrombus and the narrowing in the right iliac vein had been corrected, attention was turned to the popliteal and superficial femoral vein on the right side. Repeat venography showed that there was still some residual thrombus in the right popliteal and superficial femoral vein (Figure 12). This thrombus had a subacute appearance. In the past, after performing mechanical thrombectomy with the AngioJet and balloon angioplasty, I would normally have left this alone. This time, I decided to utilize the directional mechanical thrombectomy ability of the ZelanteDVT catheter. After directing the removal window toward the area of residual thrombus for about 10 seconds, repeat venography showed complete resolution of the residual thrombus (Figure 13). All catheters, wires, and sheaths were removed, and manual compression was held. The patient’s leg was wrapped in an elastic bandage from foot to mid-thigh. The patient was taken to the holding area and placed on bed rest for 2 hours. He received 1 L of additional normal saline intravenous fluids during that 2 hours. The patient was also encouraged to increase oral intake of fluids. The patient was continued on his anticoagulation and started on aspirin and clopidogrel. He received his postprocedural education and was discharged around 3:00 pm. The patient was contacted in the morning, and he reported that he was doing well, his leg was feeling better, and that he did have hemoglobinuria. He was again encouraged to increase oral fluid intake and ambulation. The patient was called again in the afternoon, and he reported that his hemoglobinuria had greatly improved, and his urine was almost normal in color. He returned to the office approximately 2 weeks after his procedure and was essentially pain free, and his thigh and calf had returned to normal size. He will be continued on anticoagulation for at least 6 months, aspirin for life, and clopidogrel for another 2 weeks. The patient was also referred to a hematologist/oncologist for hypercoagulable testing and further workup. I found that the ZelanteDVT catheter offered more powerful thrombectomy over the previous AngioJet catheters, allowing for faster extraction of the DVT with shorter run times. The ability to control the directional window can facilitate the removal of more persistent subacute thrombus as it did in this case. I believe that the ZelanteDVT catheter is a more purpose-built device that allows for greater ease in extraction of large vein thrombus. Jeffrey Y. Wang, MD, FACS, is a Partner of Horizon Vascular Specialists and the Director of Vascular Research for Shady Grove Adventist Hospital in Rockville, Maryland. He has disclosed that he is a consultant for Gore & Associates and a speaker for Boston Scientific Corporation and Cardiovascular Systems, Inc. Dr. Wang may be reached at jeffrey.y.wang@gmail.com.